Imagine having a condo to stay in all winter – right next to Nubs Nob and Boyne Highlands. Enjoy our on-site pools, hot tubs, fitness center and Free Shuttle to Nubs. 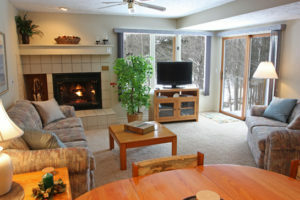 Enjoy a non-smoking condominium with a fireplace, Jacuzzi tub, fully equipped kitchen, cable TV and full size washer & dryer all winter long. Are you interested in escaping the heat during the summer time? Our southern states get awfully warm during July and August. Visit Up North for a few months. Let the trees & Lake Michigan breezes soothe your soul. A condo provides the perfect accommodations for people moving to the area who are not ready to buy a home. All of our condominiums are fully furnished and ready to go! One, two and three bedroom condos are available.